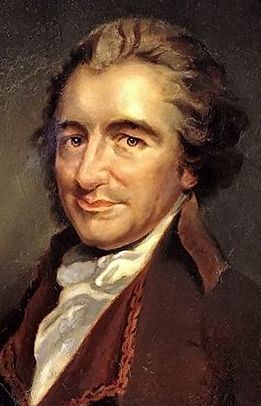 British-American author of The Age of Reason, Common Sense, Rights of Man and Crisis, Thomas Paine (1737/01/29 - 1809/06/08) has not been proven to have been a freemason. A brilliant pamphleteer, his theory about the origins of Freemasonry is only of interest as an historical curiosity. NOTE: This essay appeared in New York, 1818, with an anonymous preface of which I quote the opening paragraph: "This tract is a chapter belonging to the Third Part of the Age of Reason, as will be seen by the references made in it to preceding articles, as forming part of the same work. It was culled from the writings of Mr. Paine after his death, and published in a mutilated state by Mrs. Bonneville, his executrix. Passages having a reference to the Christian religion she erased, with a view no doubt of accommodating the work to the prejudices of bigotry. These, however, have been restored from the original manuscript, except a few lines which were rendered illegible." Madame Bonneville published this fragment in New York, 1810 (with the omissions I point out) as a pamphlet.  Dr. Robinet (Danton - Emigre, p. 7) says erroneously that Paine was a Freemason; but an eminent member of that Fraternity in London, Mr. George Briggs, after reading this essay, which I submitted to him, tells me that "his general outline, remarks, and comments, are fairly true." Paines intimacy in Paris with Nicolas de Bonneville and Charles Frangois Dupuis, whose writings are replete with masonic speculations, sufficiently explain his interest in the subject.  Moncure Daniel Conway The Writings of Thomas Paine 1896 G.P. Putnams Sons, New York. IT is always understood that Free-Masons have a secret which they carefully conceal; but from every thing that can be collected from their own accounts of Masonry, their real secret is no other than their origin, which but few of them understand; and those who do, envelope it in mystery. The Entered Apprentice knows but little more of Masonry than the use of signs and tokens, and certain steps and words by which Masons can recognize each other without being discovered by a person who is not a Mason. The Fellow Craft is not much better instructed in Masonry, than the Entered Apprentice. It is only in the Master Masons Lodge, that whatever knowledge remains of the origin of Masonry is preserved and concealed. In his introduction he says, the original institution of Masonry consisted in the foundation of the liberal arts and sciences, but more especially in Geometry, for at the building of the tower of Babel, the art and mystery of Masonry was first introduced, and from thence handed down by Euclid, a worthy and excellent mathematician of the Egyptians; and he communicated it to Hiram, the Master Mason concerned in building Solomons Temple in Jerusalem." Solomons Temple was built and dedicated 1004 years before the christian era; and Euclid, as may be seen in the tables of chronology, lived 277 before the same era. It was therefore impossible that Euclid could communicate any thing to Hiram, since Euclid did not live till 700 years after the time of Hiram. The learned, but unfortunate Doctor Dodd, Grand Chaplain of Masonry, in his oration at the dedication of Free-Masons Hall, London, traces Masonry through a variety of stages. Masons, says he, are well informed from their own private and interior records that the building of Solomons Temple is an important era, from whence they derive many mysteries of their art. "Now (says he,) be it remembered that this great event took place above 1000 years before the Christian era, and consequently more than a century before Homer, the first of the Grecian Poets, wrote; and above five centuries before Pythagoras brought from the east his sublime system of truly masonic instruction to illuminate our western world. But, remote as this period is, we date not from thence the commencement of our art. For though it might owe to the wise and glorious King of Israel some of its many mystic forms and hieroglyphic ceremonies, yet certainly the art itself is coeval with man, the great subject of it. "We trace," continues he, "its footsteps in the most distant, the most remote ages and nations of the world. We find it among the first and most celebrated civilizers of the East. We deduce it regularly from the first astronomers on the plains of Chaldea, to the wise and mystic kings and priests of Egypt, the sages of Greece, and the philosophers of Rome." A: Because all churches and chapels are, or ought to be so. A: As the Sun sets in the West to close the day, so the Wardens stand in the West, (with their right hands upon their left breasts, being a sign, and the level and plumb rule about their necks,) to close the Lodge, and dismiss the men from labor, paying them their wages. A: Because the Sun darts no rays from thence. The high festival of the Masons is on the day they call St. Johns day; but every enlightened Mason must know that holding their festival on this day has no reference to the person called St. John, and that it is only to disguise the true cause of holding it on this day, that they call the day by that name. As there were Masons, or at least Druids, many centuries before the time of St. John, if such person ever existed, the holding their festival on this day must refer to some cause totally unconnected with John. The case is, that the day called St. Johns day, is the 24th of June, and is what is called Midsummer-day. The sun is then arrived at the summer solstice; and, with respect to his meridional altitude, or height at high noon, appears for some days to be of the same height. The astronomical longest day, like the shortest day, is not every year, on account of leap year, on the same numerical day, and therefore the 24th of June is always taken for Midsummer-day; and it is in honor of the sun, which has then arrived at his greatest height in our hemisphere, and not any thing with respect to St. John, that this annual festival of the Masons, taken from the Druids, is celebrated on Midsummer-day. Customs will often outlive the remembrance of their origin, and this is the case with respect to a custom still practiced in Ireland, where the Druids flourished at the time they flourished in Britain. On the eve of Saint Johns day, that is, on the eve of Midsummer-day, the Irish light fires on the tops of the hills. This can have no reference to St. John; but it has emblematical reference to the sun, which on that day is at his highest summer elevation, and might in common language be said to have arrived at the top of the hill. As to what Masons, and books of Masonry, tell us of Solomons Temple at Jerusalem, it is no wise improbable that some Masonic ceremonies may have been derived from the building of that temple, for the worship of the Sun was in practice many centuries before the Temple existed, or before the Israelites came out of Egypt. And we learn from the history of the Jewish Kings, 2 Kings xxii. xxiii. that the worship of the Sun was performed by the Jews in that Temple. It is, however, much to be doubted if it was done with the same scientific purity and religious morality with which it was performed by the Druids, who, by all accounts that historically remain of them, were a wise, learned, and moral class of men. The Jews, on the contrary, were ignorant of astronomy, and of science in general, and if a religion founded upon astronomy fell into their hands, it is almost certain it would be corrupted. We do not read in the history of the Jews, whether in the Bible or elsewhere, that they were the inventors or the improvers of any one art or science. Even in the building of this temple, the Jews did not know how to square and frame the timber for beginning and carrying on the work, and Solomon was obliged to send to Hiram, King of Tyre (Zidon) to procure workmen; "for thou knowest, (says Solomon to Hiram, i Kings v. 6.) that there is not among us any that can skill to hew timber like unto the Zidonians." This temple was more properly Hirams Temple than Solomons, and if the Masons derive any thing from the building of it, they owe it to the Zidonians and not to the Jews.  But to return to the worship of the Sun in this Temple. Besides these things, the description that Josephus gives of the decorations of this Temple, resembles on a large scale those of a Masons Lodge. He says that the distribution of the several parts of the Temple of the Jews represented all nature, particularly the parts most apparent of it, as the sun, the moon, the planets, the zodiac, the earth, the elements; and that the system of the world was retraced there by numerous ingenious emblems. These, in all probability, are, what Josiah, in his ignorance, calls the abominations of the Zidonians. [NOTE by PAINE: Smith, in speaking of a Lodge, says, when the Lodge is revealed to an entering Mason, it discovers to him a representation of the World; in which, from the wonders of nature, we are led to contemplate her great original, and worship him from his mighty works; and we are thereby also moved to exercise those moral and social virtues which become mankind as the servants of the great Architect of the world.  Author.] Every thing, however, drawn from this Temple [NOTE by PAINE: It may not be improper here to observe, that the law called the law of Moses could not have been in existence at the time of building this Temple. Here is the likeness of things in heaven above and in earth beneath. And we read in I Kings vi., vii., that Solomon made cherubs and cherubims, that he carved all the walls of the house round about with cherubims, and palm-trees, and open flowers, and that he made a molten sea, placed on twelve oxen, and the ledges of it were ornamented with lions, oxen, and cherubims: all this is contrary to the law called the law of Moses.  Author.] and applied to Masonry, still refers to the worship of the Sun, however corrupted or misunderstood by the Jews, and consequently to the religion of the Druids. Another circumstance, which shows that Masonry is derived from some ancient system, prior to and unconnected with the christian religion, is the chronology, or method of counting time, used by the Masons in the records of their Lodges. They make no use of what is called the christian era; and they reckon their months numerically, as the ancient Egyptians did, and as the Quakers do now. I have by me, a record of a French Lodge, at the time the late Duke of Orleans, then Duke de Chartres, was Grand Master of Masonry in France. It begins as follows: "Le trentieme jour du sixieme mois de l'an de la V.L. cinq mille sept cent soixante treize;" that is, the thirteenth day of the sixth month of the year of the Venerable Lodge, five thousand seven hundred and seventy-three. By what I observe in English books of Masonry, the English Masons use the initials A.L. and not V.L. By A.L. they mean in the year of Light, as the Christians by A.D. mean in the year of our Lord. But A.L. like V.L. refers to the same chronological era, that is, to the supposed time of the creation. [NOTE: V.L. are the initials of Vraie Lumiere, true light; and A.L. of Anne Lucis, in the year of light. This and the three preceding sentences (of the text) are suppressed in Madame Bonnevilles pamphlet, 1810.  Editor.] In the chapter on the origin of the Christian religion, I have shown that the Cosmogony, that is, the account of the creation with which the book of Genesis opens, has been taken and mutilated from the Zend-Avesta of Zoroaster, and was fixed as a preface to the Bible after the Jews returned from captivity in Babylon, and that the Robbins of the Jews do not hold their account in Genesis to be a fact, but mere allegory. The six thousand years in the Zend-Avesta, is changed or interpolated into six days in the account of Genesis. The Masons appear to have chosen the same period, and perhaps to avoid the suspicion and persecution of the Church, have adopted the era of the world, as the era of Masonry. The V.L. of the French, and A.L. of the English Mason, answer to the A.M. Anno Mundi, or year of the world. The religion of the Druids, as before said, was the same as the religion of the ancient Egyptians. The priests of Egypt were the professors and teachers of science, and were styled priests of Heliopolis, that is, of the City of the Sun. The Druids in Europe, who were the same order of men, have their name from the Teutonic or ancient German language; the German being anciently called Teutones. The word Druid signifies a wise man. [NOTE: German drud, wizard. Cf. Miltons line: "The star-led wizards haste with odours sweet." The word Druid has also been derived from Greek ####;, an oak; Celtic 'deru,' an oak and 'ndd,' lord; British 'deruidhon,' very wise men; Heb. 'derussim,' contemplators; etc.  Editor.] In Persia they were called Magi, which signifies the same thing.